The Wage and Hour (Spanish) is a general labor law poster poster by the Kentucky Labor Cabinet. This is a mandatory posting for all employers in Kentucky, and businesses who fail to comply may be subject to fines or sanctions. This poster, written in Spanish, must be posted in a conspicuous place where all Spanish speaking employees will see it. This post describes the Minimum Wage Law with regard to tipped and untipped employees as well as how overtime pay is calculated, and information on payment of wages and information on rest and lunch periods. It appears you don't have a PDF plugin for this browser. 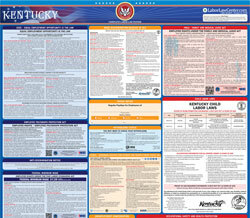 Please see the link below to download kentucky-ky-wage-and-hour-poster-spanish.pdf. e sta b le c id o  por  U .S .C . 29  Secc ió n  206   (a )  (1 ). d e l a s p ro p in as d e l o s e m ple a d os d el e sta b le c im ie n to . e m ple a d os  sa la ria d os  o  q ue  so n p ag ad os  p or  h ora . t o dos lo s s a la rio s q ue e l  e m ple a d or te n ga q ue p ag ar.